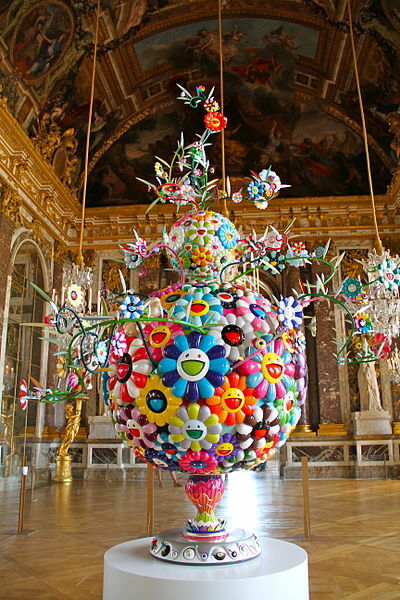 Our earlier post on modern art at the Centre Pompidou reminded the ETs of another divisive Art Experience at the Chateau of Versailles. The ETs are usually a model of harmonious travel. 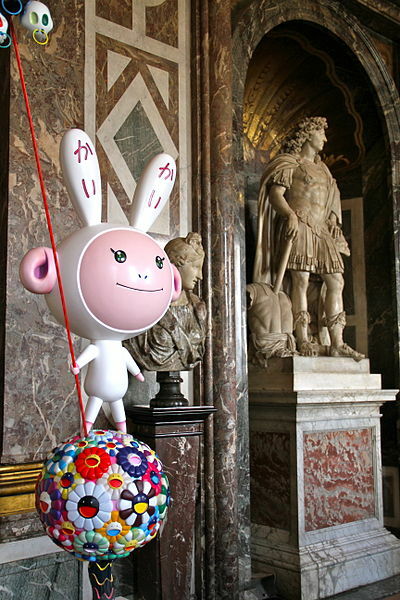 But the exhibit of 22 works by pop artist Takashi Murakami at the Chateau ignited a disgreement that still simmers. 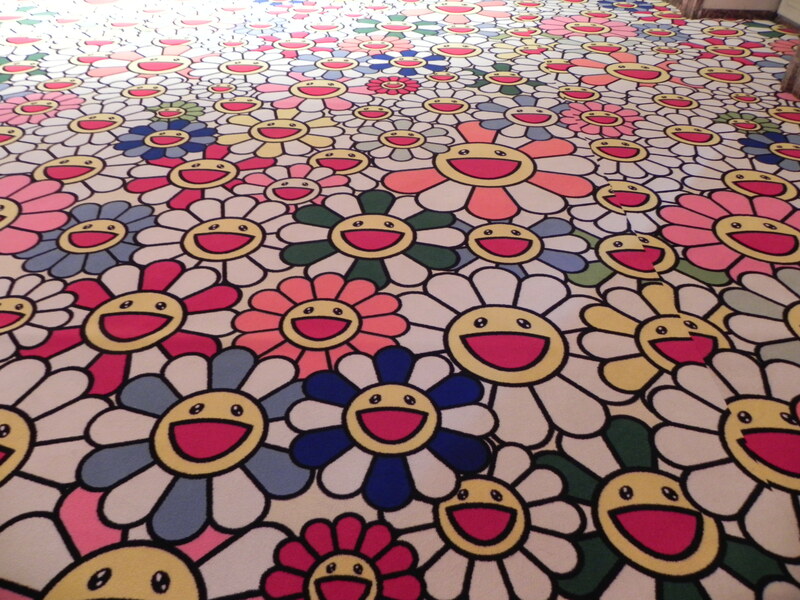 Murakami specializes in manga, a Japanese art form that uses cartoons and comic characters. The exhibit was controversial, even before it opened. 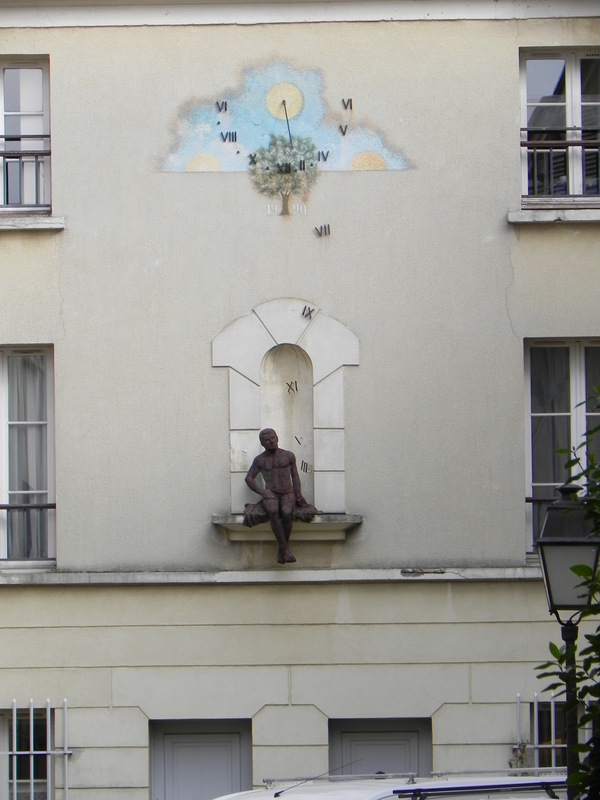 A group called “Coordination Defense de Versailles” circulated a petition against it. Defenders argued that it made an historic relic relevant. Prince Sixte-Henri de Bourbon-Parme, the “heir to the French crown”, argued that the exhibit was illegal. He sued to prevent the display, which he considered an affront to all Bourbons, living and dead. In a very Republican turn of events, he lost. The ETs cheerfully arrived at the Chateau, unaware of the swirling controversy. 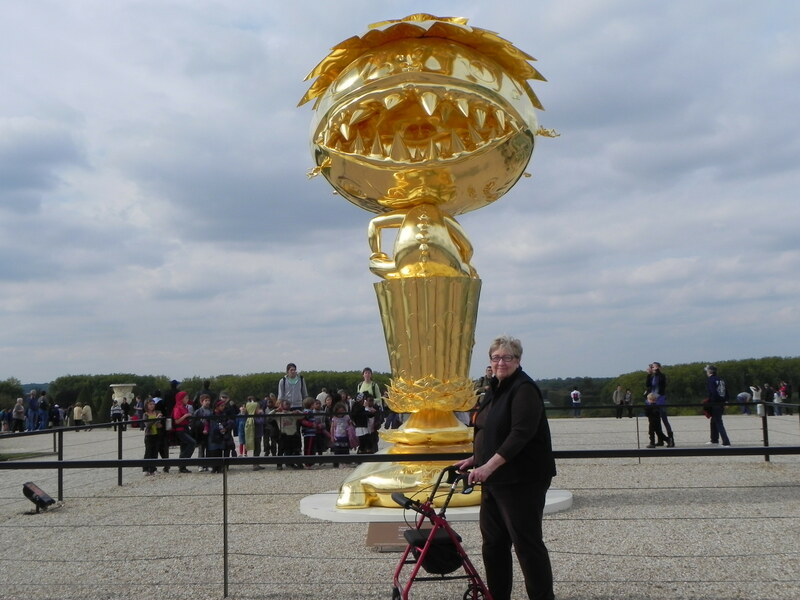 A giant gold Buddha in the gardens was the first clue that this visit to Louis’ old chateau would be different. Nurse made a gleeful sound and beelined to it. I froze in my tracks and stared. By the time we entered the palace, I knew that something very, very wrong had transpired. They were *everywhere*. The Queen’s bedroom. The Coronation room. 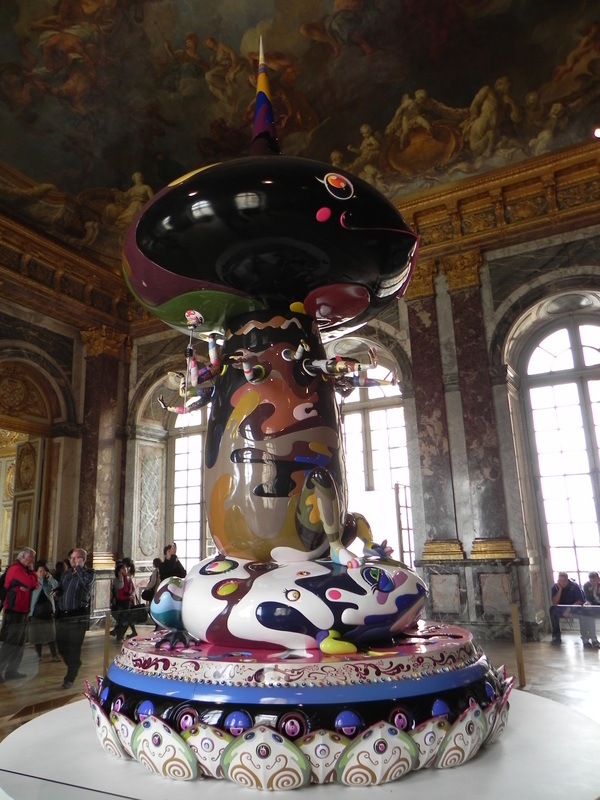 “Hello Kitty” meets the Hall of Mirrors. Nurse was delighted by the huge, colorful outer-space characters. I hoped that modern-day Monarchists were secretly convened to debate the practicality of sending a cartoon character to the guillotine. 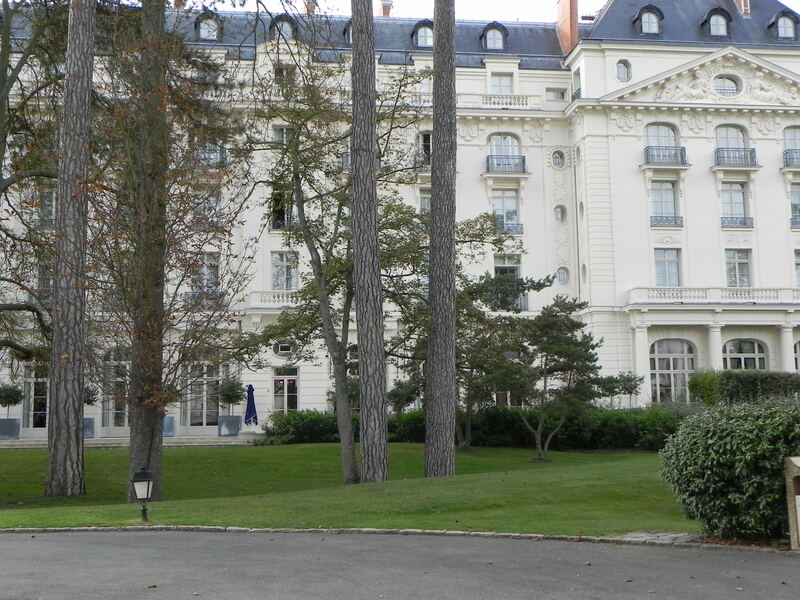 Our Disney-meets-“Dangerous Liasons” tour of the Chateau gave the ETs debate material for days. My objection to the Murakami exhibit makes me wonder; What would I have thought about the works of avant-garde artists like Manet and Whistler at the “Salon des Refusés” of 1863? Art or outrage? More lunch with Gordon: the food! Little beehives of sweet and salted butter. Every detail was exquisite. Go slip into your best bib! The Experienced Travellers are taking you on a culinary pilgrimage as they revisit their Gordon Ramsay lunch at the Trianon Palace Hotel. By popular mandate, here are the complete, unabridged food pictures. Consider yourself warned. 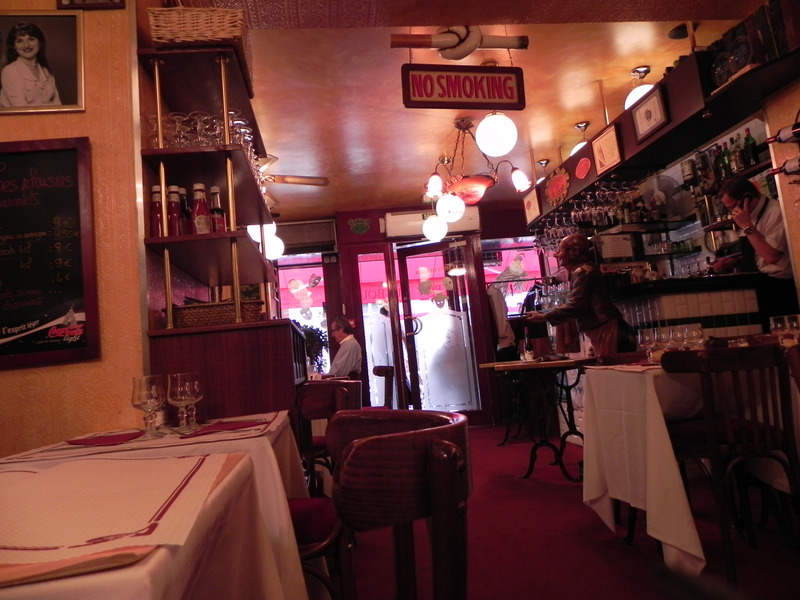 This journey required a roadmap, and it was thoughtfully provided by the maitre’d. Armed with flutes of fine champagne, we strategized over the menu to plot our meal. The ETs were focused, confident – and hungry. We knew we could go the distance. 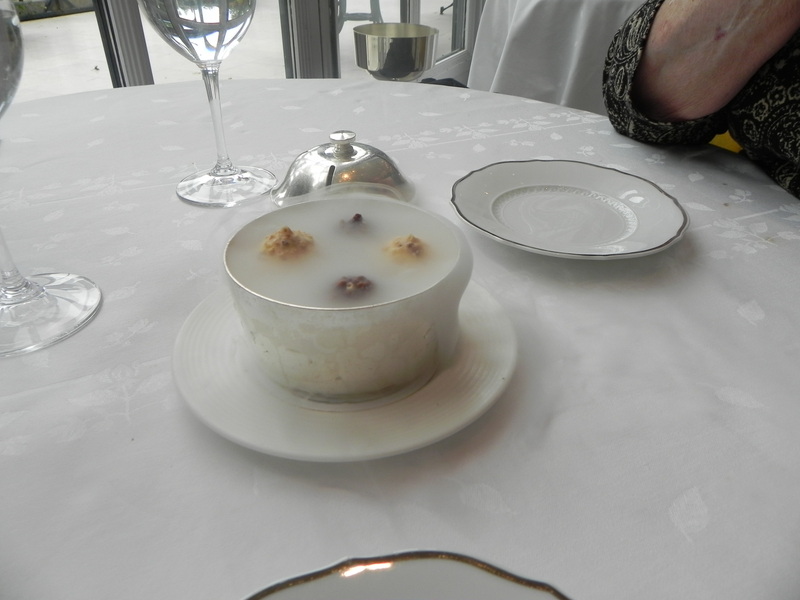 The amuse bouche was a caesar salad. On top is bufala mozzarella, with a little something extra. The fork pierces the cheese and “whoosh” – it’s stuffed with a delicate salmon mousse! Underneath is shredded lettuce, anchovy and a crouton. We never found out what the black disc was, but who cares! The champagne flowed, and all was well. These are perfect paper-thin potato chips (not the wavy kind), and crisp sesame bread with two dips – one eggplant and the other with caviar. My standard for chips and dip has been raised forever. The first course on the menu arrived. 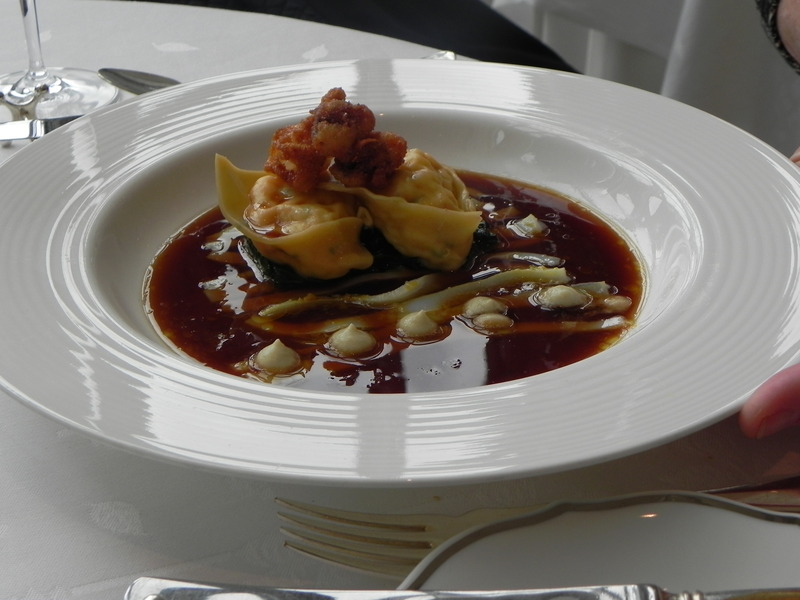 Lobster tortellini with squid carpaccio in a consomme broth. It was lovely to look at, and spectacular to eat. 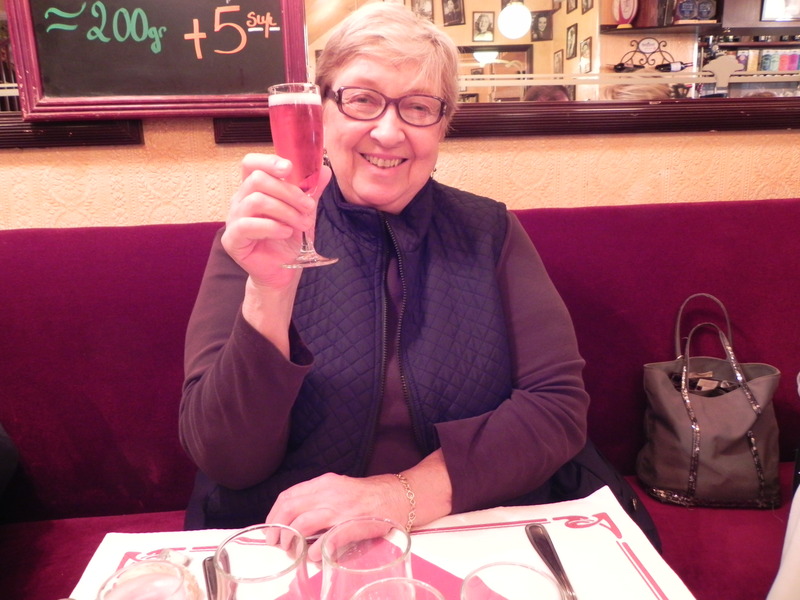 By now, Nurse progressed from the champagne to a Fitou Cuvee Cadette 2007 from Domaine les Milles Vignes. I had a Riesling. A mild light-headedness and all-around goodwill was setting in. We rested between courses, while our attentive waiters watched over us. Up came the second course. For me, John Dory – with a cepes and chanterelles mushrooms fricassee in a basil vinaigrette (and a little smiley of sliced radishes for good measure). 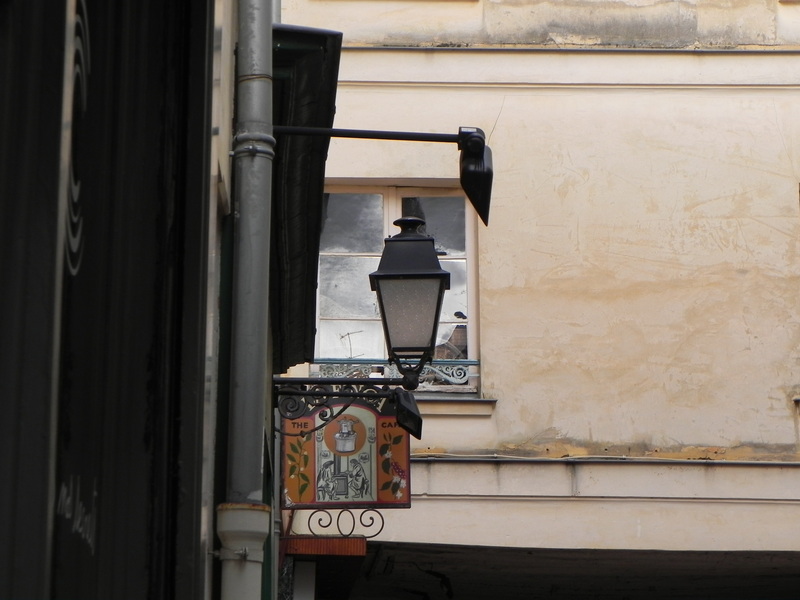 The Pigeon. This dish changed the way we looked at pigeons for the rest of the trip. Nurse chose the pigeon. 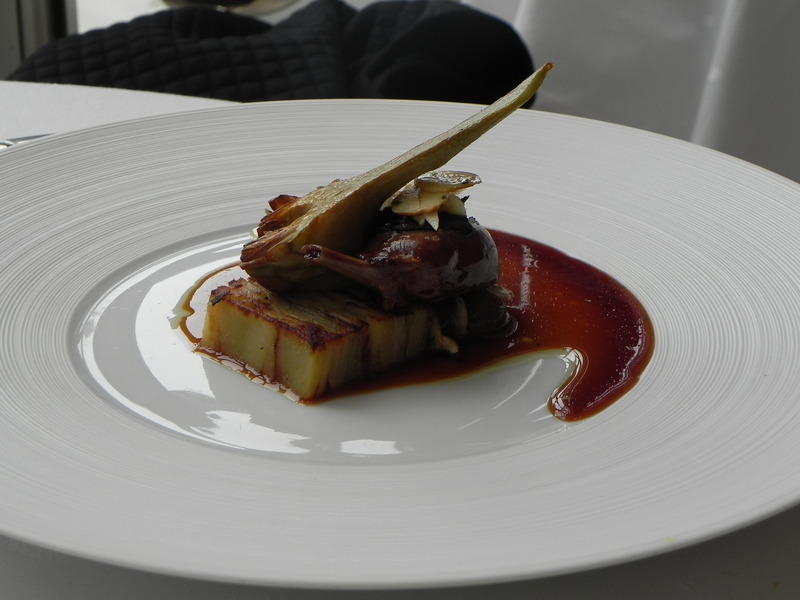 The taste and texture suggested that this Bresse pigeon could be a relative to the famous chickens of the same area. This was served on potatoes and artichoke terrine, Muscat grapes and almonds. 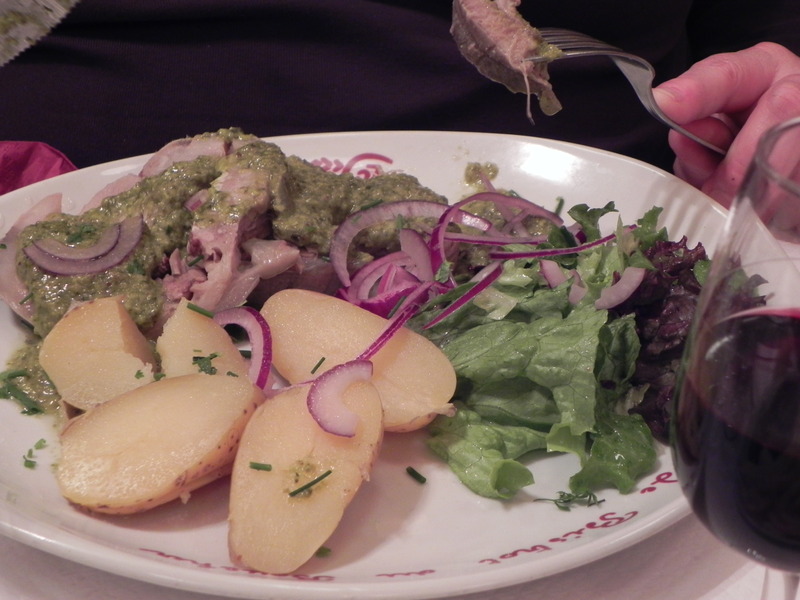 The memory of this dish threatened every plump pigeon we saw in the Luxembourg Garden. 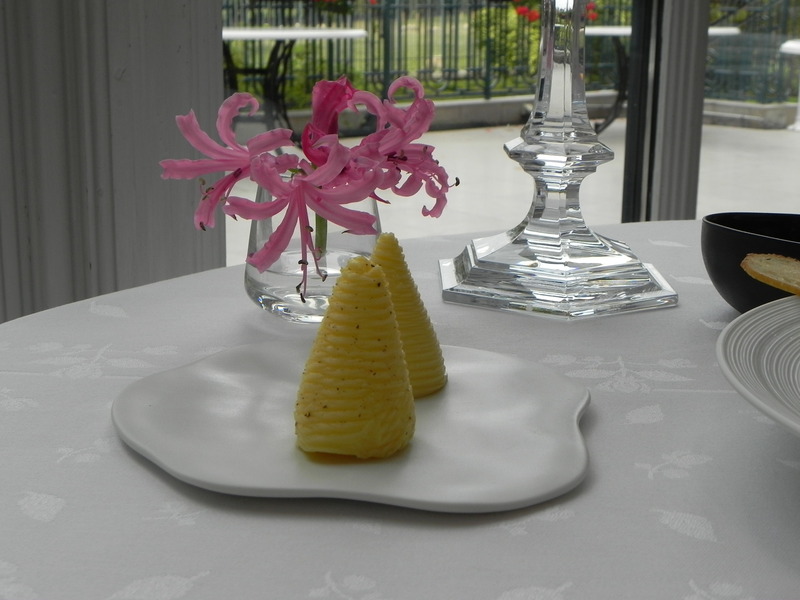 There were waiters whirling all round us, clearing dishes and using those little crumb brushes. 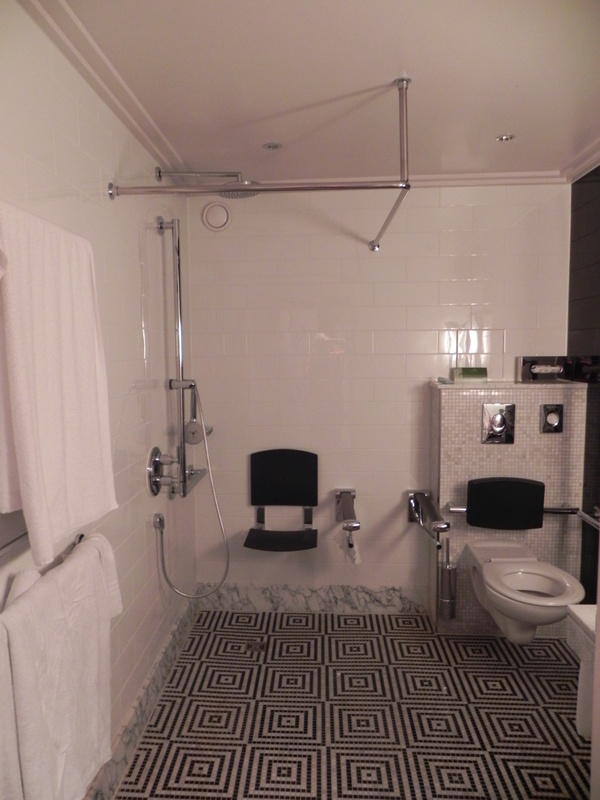 The room felt smaller and more expansive at the same time. We were beginning to feel… so very full. While waiting for dessert, we were served a pre-dessert. Maybe it was meant to get us warmed up for the actual event. 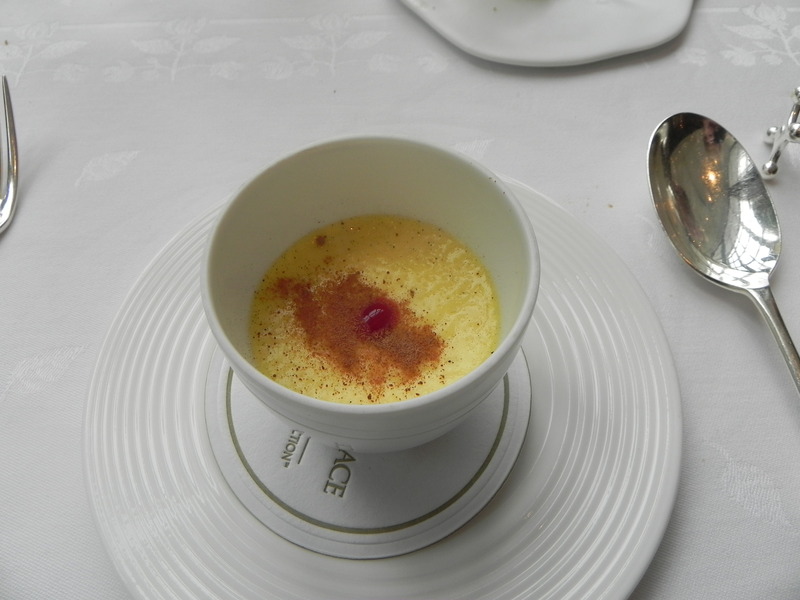 This custard with raspberry chutney was light and wonderful. At this point, we’re an hour and fifteen minutes into it, and the ETs are deeply aware of the importance of pacing. We slumped slightly in our chairs. Eyelids were drooped. Heads bobbed from side-to-side. How do the real food-iacs do this? 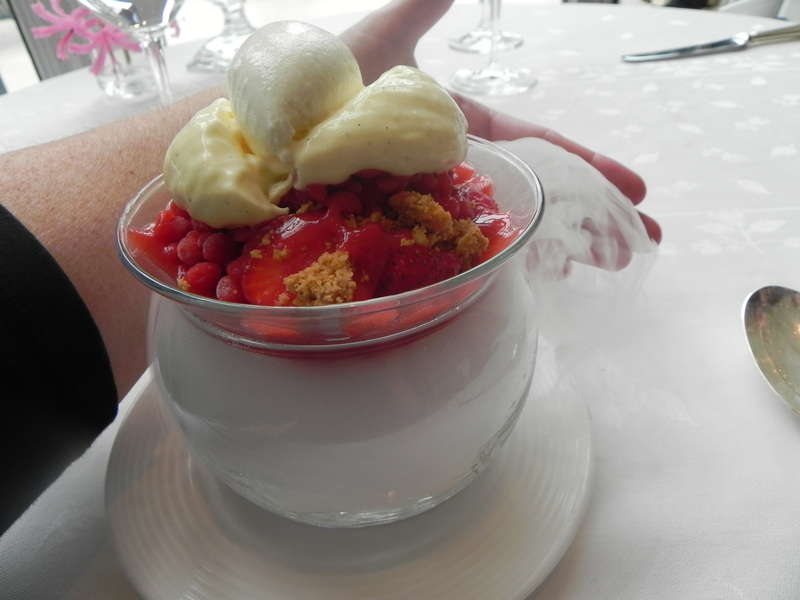 Now the real dessert arrived – floating on a gossamer mist. Heaven-sent strawberry cheesecake. Fresh, chopped strawberries with lovely crusty bits and a sabayon. To demonstrate the educational value of this meal, I can now say and spell sabayon (a whipped sauce – this one flavored with kirsch). As we wearily rested our spoons from the cheesecake, we heard the rumbling of a cart. And there appeared before us, an abundance of cheeses. All the will, and all the strength of the French nation was on that cart; slices and rounds; blocks and wedges. 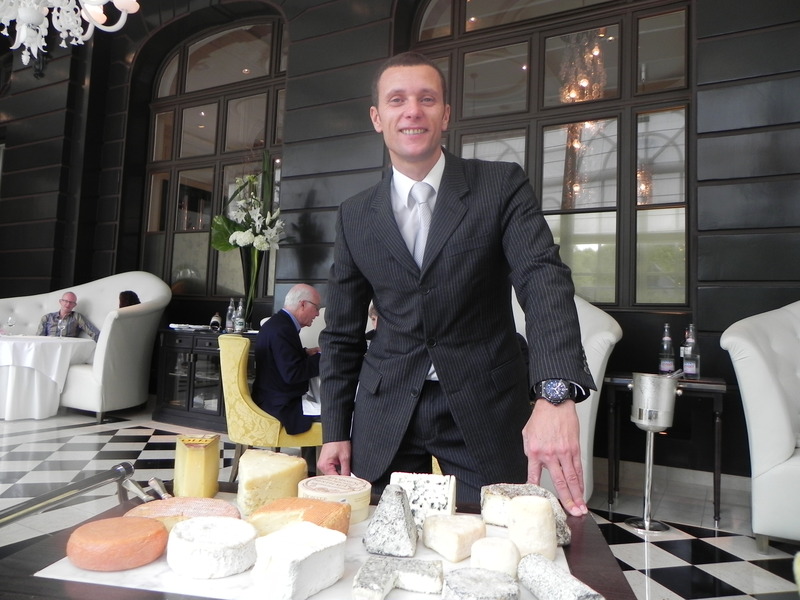 We chose a bleu, a hard yellow cheese, a brie and — the shining star – an Époisses de Bourgogne. Cheese of this magnitude deserves a remarkable conveyance. 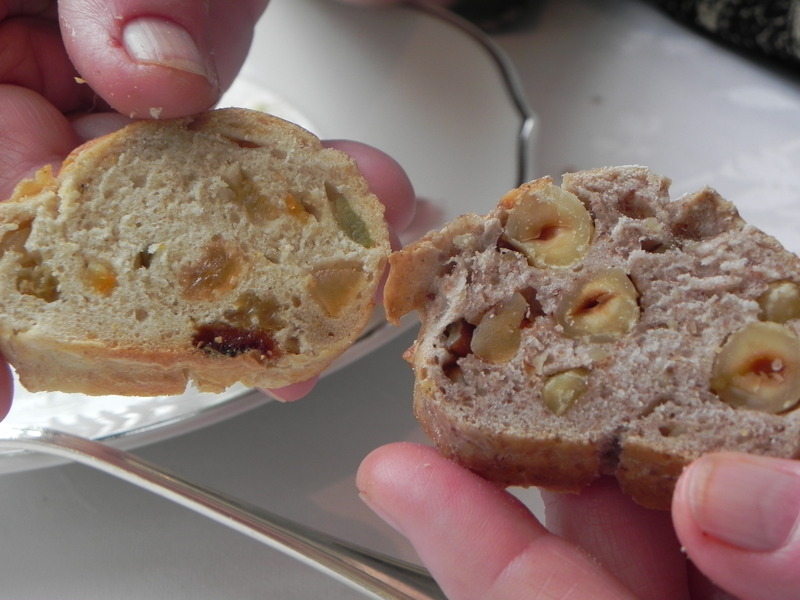 The artisan bread filled with hazelnuts and golden raisins was perfect. The ETs marshalled our diminishing strength to give the cheeses the attention and praise they deserved. We quietly called upon the Immortals of France to lead us through. This was the last course on the menu. Surely, we could persevere and conclude this exquisite meal with honor. But there was more. Yes, more! The final course is perfect ice cream truffles asea in a bowl of dry ice, smoking like holy incense at a sacred feast. The truffles transported the weary ETs to a final phase of dining that passeth all understanding. Only a visit from Gordon himself could bring the ETs to rise from their chairs. He didn’t appear, but the ETs did slowly stumble out of the restaurant, awed by the experience. I have a vague, wine-infused memory of paying the bill which I did without a qualm. It was a magnificent, memorable meal. 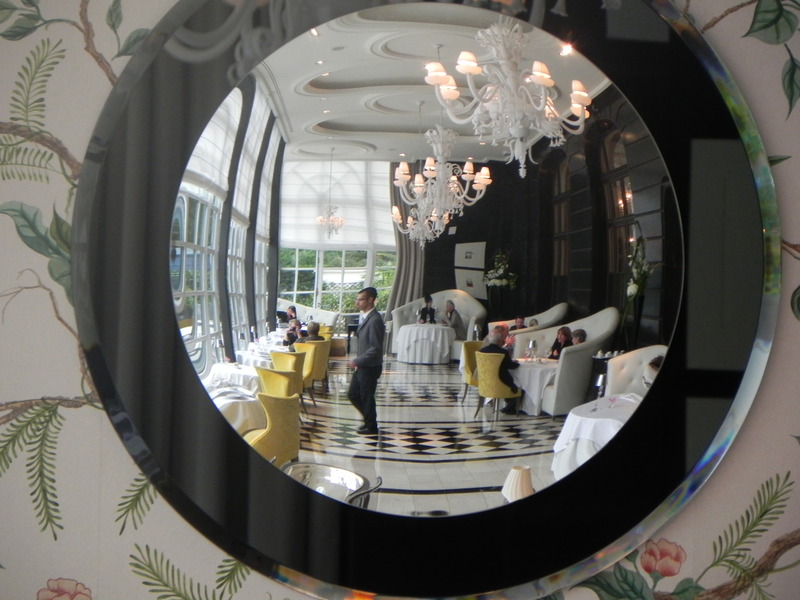 Gordon Ramsay’s restarant at the Trianon Palace Hotel in Versailles. I expected fast, mediocre and expensive. I was only right on one count. 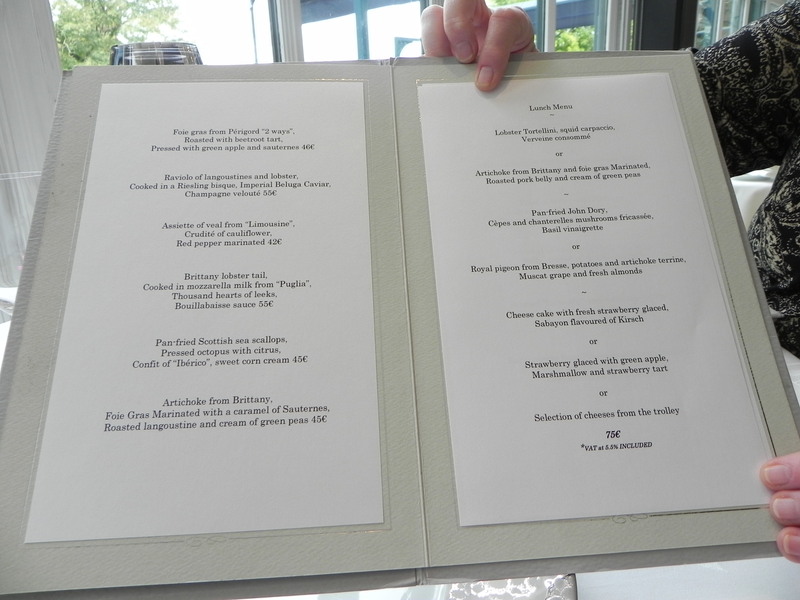 The three-course lunch menu was actually eight unbelievable courses, wine and champagne. The 15-table restaurant was comfortably full. Nurse noticed lots of generous businessmen taking their nieces out for a leisurely lunch…. Our table looked out over a community of contented goats and sheep, presumably from Marie Antoinette’s Petite Trianon. It might be a point of conscience that lamb was not on the menu. It took two and a half hours to eat and four waiters to serve. 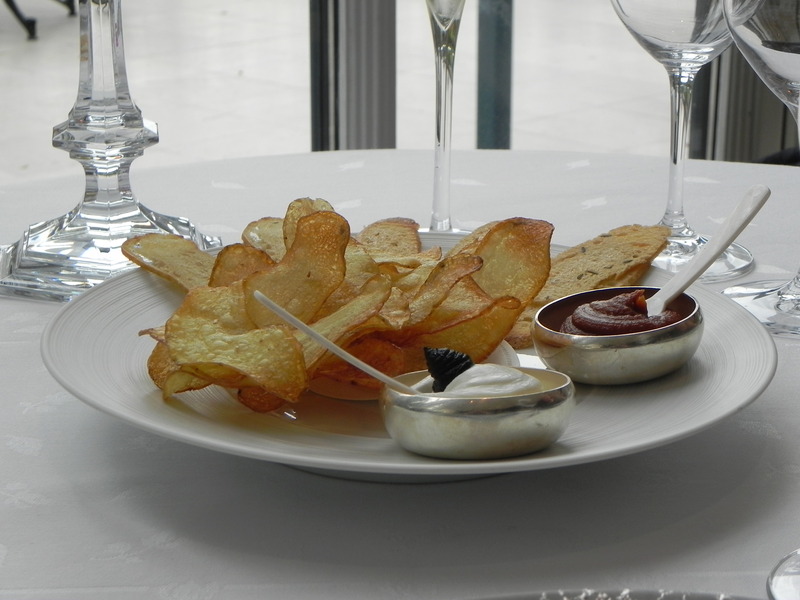 Paper thin croutons and potato crisps with two spreads – eggplant and goat cheese with caviar. Caesar salad and mozzarella stuffed with salmon mousse. 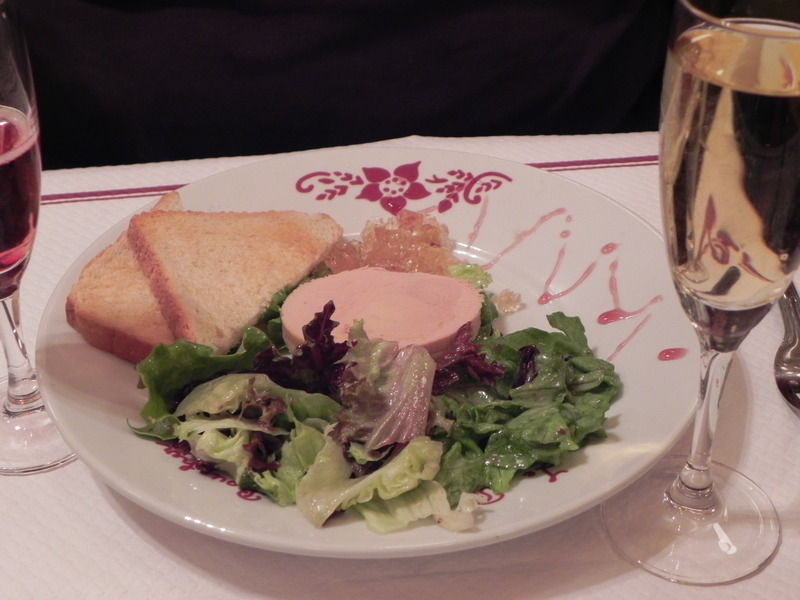 Pate de fois gras. Lobster ravioli. Roast pigeon. John Dory. Custard with raspberry coulis. Strawberries with creme freche and a crumbled crust. 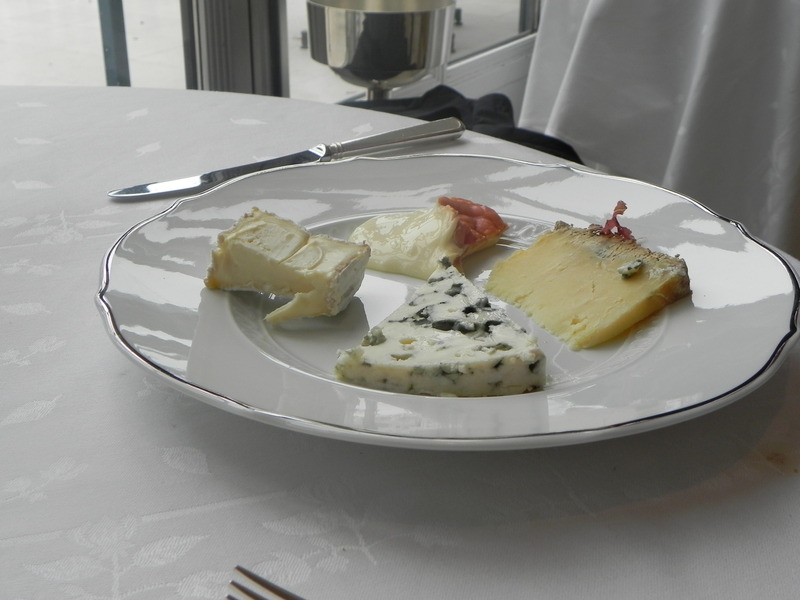 Five kinds of cheese (the cheese that the French don’t export.) 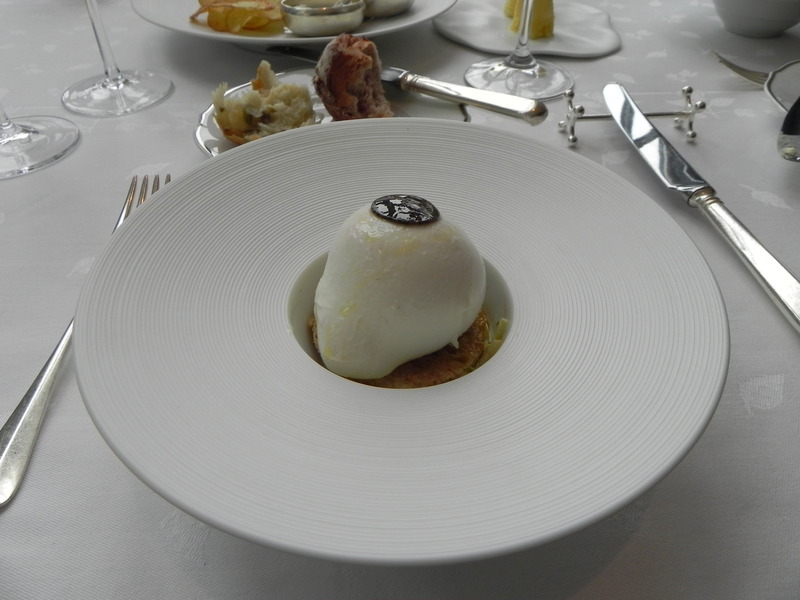 Desert truffles served on dry ice. Complete exhaustion. I immediately underwent a psychic exorcism to forget how much it cost, so don’t bother asking. 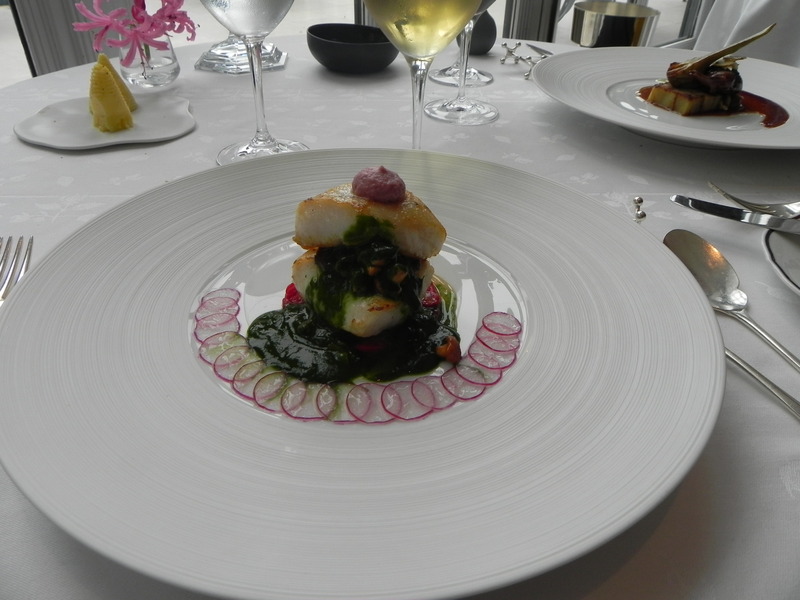 I was repeatedly amazed by the delicate, interesting flavors and textures. It’s good to experience this kind of dining just once. I have to hand it to Gordon.